Tamilnadu Assembly Election 2016 - Counting Results started at 8.00 a.m. Today First the postal ballots are counting, then EVM machine results will be counted. After 9.00 a.m. Official results will update within every few minutes. So Our Team also waiting eagerly for update our election news. 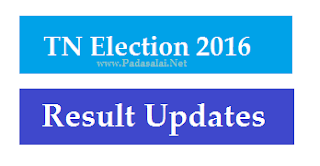 # All Result News will update within One Second.